No matter the climate, cleaning tack for spring riding is a chore worthy of attention. Tack that is well cared for not only looks good but is also more comfortable for the horse and rider. Plus, tackling leather cleaning now will give riders more time to ride once the spectacular spring weather makes its return. This four-step checklist will help riders ensure that their leather tack is in great condition and ready to use. Checking the surface of leather for cracks. Bending the leather to test elasticity — leather will wrinkle if in good condition. Testing the stitching by pulling on the straps. If stitches separate or appear loose, they should be repaired. Since leather is naturally oily, it attracts dirt that can be ground into the grain and should be cleaned after every ride to save time and effort when a major cleaning is performed. A major cleaning should be done regularly to prolong and protect the life of leather. Remove any excess dirt using a dry, clean cloth. Apply a tack cleaner, such as Horse Health One-Step Leather Cleaner & Conditioner, to remove embedded dirt, sweat and grime. Unlike other leather cleaners, its thick, creamy formula won't run or drip, making it ideal for removing dirt in hard-to-reach areas. Rub thoroughly until leather cleaner completely disappears into the leather, then buff with a clean, dry cloth to bring out the shine. Leather dries out when exposed to heat or water and should be conditioned at the beginning and end of the season, as well as several times throughout the year depending on climate. Don't wait until the leather feels hard or inflexible; it will take much more effort to return to its original condition when it's in that state. Avoid using conditioners with silicones, waxes or petroleum — they can damage stitching. Preferably, use a deep conditioner that is oil-based, such as the Horse Health One-Step Leather Cleaner & Conditioner, which utilizes a unique avocado oil-based formula that penetrates deeply to restore lost moisture and keep leather soft and pliable. Apply the conditioner to tack before it's completely dry from cleaning. Use a clean, dry cloth to work the conditioner into the leather on both the grain and flesh sides. Do not over-saturate; excess oiling can make leather "soggy". As a rule of thumb, leather should feel soft, but not limp. Allow leather to dry completely, then buff with a clean, dry cloth. Leather will absorb what it needs to restore suppleness, so drying time and number of applications will vary. One of the top contributors to leather tack damage is improper storage. Leather is sensitive to environmental conditions, so making sure that tack is properly stored can extend its life and keep it looking like new. Avoid storing leather tack in direct sunlight, which can dry out leather, or in damp, dark places, where moisture can deteriorate the leather. Use fabric covers on bridles and saddles, so the leather can breathe. Always use a saddle stand to store saddles, since they tend to form to whatever they're placed on. 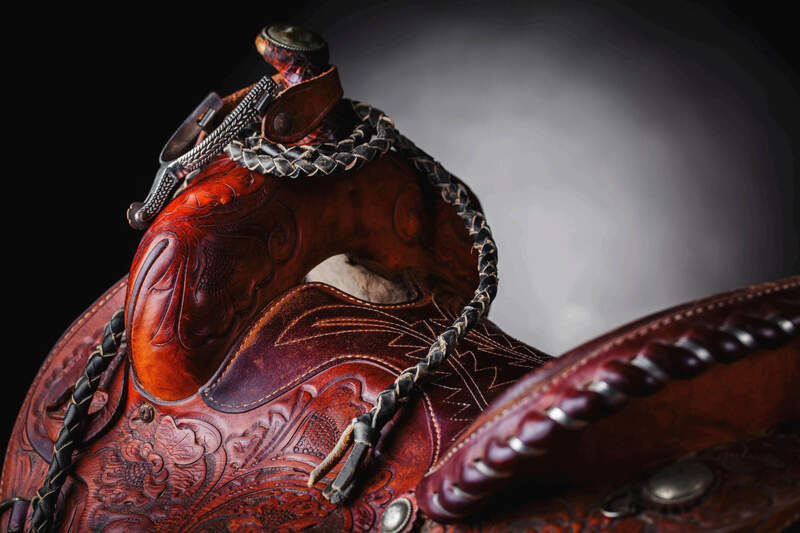 By following these four steps to leather care, riders can not only take pride in the condition of their tack, they can also be assured of their own and their horses' comfort. Happy Springtime Riding!